75' Hatteras cockpit motor yacht | Christian & Co. The vessel was inspected while hauled. Hull construction material is molded fiberglass. Deck is constructed of molded fiberglass and above deck structures are constructed of molded fiberglass. Coring is unknown. Bulkheads are constructed of plywood. Overall condition of the hull structure appears good. The vessel’s weight is unknown. Exterior rails and hardware appear good. Cosmetic condition of vessel appears satisfactory externally and satisfactory internally. Vessel’s external colors are white with black boot stripe. Below waterline through hull fittings appear satisfactory. The vessel is equipped with five electric/automatic bilge pumps that appear satisfactory – good and the bilge is holding minimal water. The ventilation system consists of engine room blowers and appears good. General housekeeping appears good, but boat is currently “in the yard”. The condition of the coring, in the stringers, deck, and elsewhere as applicable, is beyond the scope of this inspection. Engines’ external surfaces appear satisfactory and exhibit moderate leaks. Engine hour meters exhibit 211 and 211 hours. Motor mounts appear satisfactory. Cooling systems appear satisfactory. Fuel systems and components appear satisfactory. Exhaust systems and components appear satisfactory. Electrical systems and components appear satisfactory. Engine control systems appear satisfactory and shaft logs appear satisfactory. Steering control systems appear satisfactory and rudder ports appear satisfactory. Propulsion components appear satisfactory. Generator surfaces and motor mounts appear satisfactory. Generator’s peripheral components and systems appear satisfactory. Generators’ model 20MDL4B303668. Port serial # H880150284 and 2811 hours on meter, Starboard serial # H880150248 and 2963 hours on meter. Waste systems and components appear satisfactory. General service seawater systems appear satisfactory. There is unknown capacity in fiberglass tanks located in center bilge and elsewhere perhaps. Fuel tank surfaces, where visible, appear satisfactory (mostly inaccessible) and the securing mechanism appears good. The fuel fill, vent, feed and return lines and components appear satisfactory. Fuel shutoff valves are located in various places and appear satisfactory. The AC shore cord, inlets and connections appear satisfactory. The AC wiring and outlets appear satisfactory. The AC main feeds are protected with fuses and circuit breakers. Battery arrangement appears satisfactory. Batteries are equipped with disconnect switches. DC wiring appears satisfactory. Circuit protection for the AC and DC branch system appears satisfactory. Wire terminations and connections appear satisfactory. Wire organization and arrangement appears satisfactory. Vessel has five portable fire extinguishers with current certification – 2011. Vessel has CO2 fixed fire suppression system with units in port engine room and generator room with current certification – August 2011. The safety components include: numerous PFDs and one throwable PFD; distress flares with expired certification – 2008; two Avon 8 person life rafts with expired certification – August 2007; suitable first aid kit; 50 KG Bruce anchor with chain rode that appears satisfactory. Navigational and anchor lights appear satisfactory (not tested). Other safety equipment includes: ship’s bell, EPIRB (March 2010 battery). The vessel was not inspected at its normal slip location. The vessel is a fiberglass motor yacht equipped with two diesel engines and two diesel generators. The client purchased the vessel in 2006 in Miami. 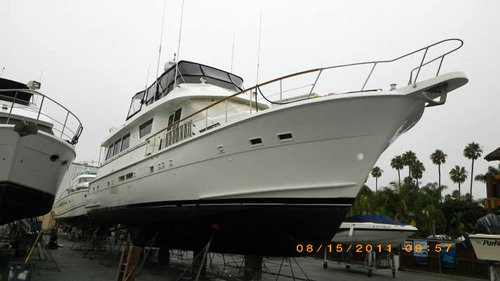 Upgrades to the vessel have included a new battery charger, clothes washer and dryer, added storage with custom lockers, new carpet throughout the vessel, towel warmers, televisions, television cabling, new Tecma heads, forward head converted to an office, flybridge enclosure and significant engine and generator repairs. The vessel is currently hauled and undergoing various projects including the elimination of nine through hulls, servicing fin stabilizers and repainting the boot stripe. The client lives aboard the vessel. The vessel was inspected while hauled. The vessel appears basically structurally and mechanically sound. 2. Maintain the life rafts per the manufacturer’s recommendations, relocate life rafts from beneath the flybridge enclosure. 3. Maintain the EPIRB per the manufacturer’s recommendations, replace the battery. 4. Display the hull identification number per federal regulations. 5. Display the documentation number per federal regulations. 6. Replace the cracked air conditioner raw water hoses visible to port forward in the engine room. Inspect other similar hoses and replace as needed. 7. Replace the damaged hose at the port engine’s raw water pump. Eliminate the leak, clean stains and corrosion below the leak to allow detection of any future leaks. 8. Properly cap or plug the unused through hull aft of the starboard transmission. 9. A green battery cable is disconnected near the starboard engine’s starter. The client stated that this condition has existed since purchase. Address as necessary. 10. There are salt crystals by the starboard engine’s starter, service to eliminate the source of the salt crystals and clean to remove them to allow detection of any future leaks. 11. The plywood base below the aft generator is bowed downward, repair this component. 12. There is salt visible on the top of the forward generator’s sound box, service to eliminate the source and clean to remove the salt to allow detection of any future weeps or leaks. 13. The compass on the flybridge is badly cracked, replace the lens. 14. Through hull repairs are in progress, an unused through hull was found in the bilge near the clothes washer/dryer. Assure that all through hulls are either used or properly capped or plugged. Carefully inspect the through hull work upon launching the vessel. 1. There is a moderate blister condition on the hull bottom, the hull bottom was drying at the time of survey thus limiting the visibility of blisters. There are likely one hundred blisters larger than 1” in diameter, with sizes up to 1.5” in diameter, there are more smaller blisters, repair blisters or monitor and repair as necessary. 2. There is anti-fouling paint damage around the through hulls (halo damage), properly prepare and repaint these areas. 3. The trim tabs are bent, repair if/as desired. 4. Several swim platform supports are bent, repair if/as desired. 5. There are a few patches and scratches on the hull sides and transom, address cosmetically as desired. 6. Repair cracks at the transom door, near the hinges. 7. The client is currently pulling various cables through the vessel including high definition television cables and cable onto the flybridge.